Very recently, my t-shirt printers Printful launched a new tool that allows Etsy sellers to connect their shops. It offers seamless customer ordering + fulfillment of Printful products. Which is SO. COOL!! Well, all is not perfect… Here’s the backstory…. When they launched this thing, I had already begun to sell t-shirts fulfilled by Printful. So, it LOOKS like it happened at the perfect time for me. See, I’d already been busy populating my Etsy shop with LOTS of Printful tees BEFORE they launched this tool. (That was a big wrinkle.) Plus, I sell with another Print On Demand company for my mugs! (…another potential wrinkle?) So, yes! I had a big ol’ wrinkly pile of t-shirts to iron out. Because, no matter how cool this new tool seemed to be (and IS), I had some pre-existing “seller circumstances” to solve. Well, I did just that. The silver lining? 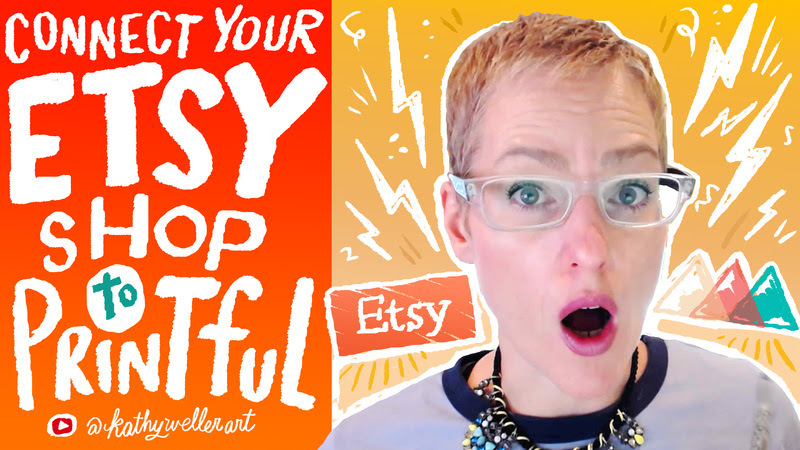 I put ALL of my Etsy-Printful integration tips and experience (…thus far) into this video I made for you! Do you have Etsy shop? Have you been thinking of opening one and selling t-shirts or other products? Maybe you’ve been curious about selling with Printful. Maybe you already DO sell with Printful, but you have been AFRAID to integrate this new tool with your ETSY shop for fear that something will BREAK your store. (Preachin’ to the choir!) I got you covered. I really hope the video helps you! If any questions come up after you watch it, please let me know. Just leave a comment on the You Tube video’s page to let me know there.